Myers-Briggs Sample Reports - MDR Coaching & Consulting Inc. This assessment identifies which of 16 different personality types best describes you. 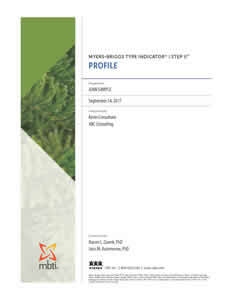 See a sample of a MBTI Sample Step 1 Profile. See a sample of a MBTI Sample Step 1 Assessment. Your Myers-Briggs® Step II™ Profile gives you information about your personality type based on your answers to the MBTI® assessment. It first indicates your Step I™ results—your reported four-letter type. Next it shows your Step II results—your expression of five facets for each of the four Step I preference pairs. See a sample of a MBTI Step II Profile Report. Your Myers-Briggs® Step II™ Interpretive Report is an in-depth, personalized description of your personality preferences, derived from your answers to the MBTI® assessment. It includes your Step I™ results and your four-letter type, along with your Step II results, which show some of the unique ways you express your Step I type. 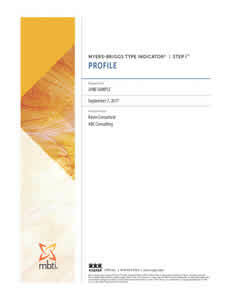 See a sample of a MBTI Step II Interpretative Reported Type. 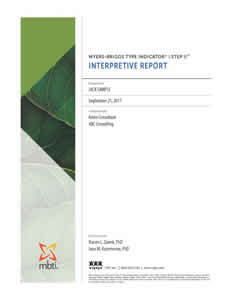 See a sample of a MBTI Step II Interpretative Report Verified Type. The purpose of this report is to help you improve your working relationship with a designated colleague. See a sample of a MBTI Sample Comparion Report. 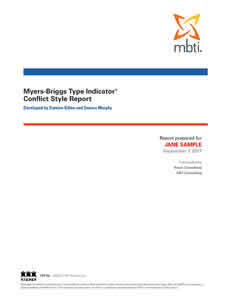 This report uses your results on the Myers-Briggs Type Indicator® (MBTI®) assessment to describe how you are likely to approach and deal with conflict situations. See a sample of a MBTI Sample In Conflict Report. Your Myers-Briggs® Interpretive Report for Organizations is designed to help you understand your results on the Myers-Briggs Type Indicator® (MBTI®) assessment and how you can use them to optimize success at work. 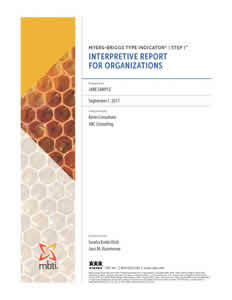 See a sample of a Myers Briggs Type I️ Interpretive Report for Organizations Sample Report. This report presents information to help you make use of your Myers-Briggs Type Indicator® (MBTI®) results. 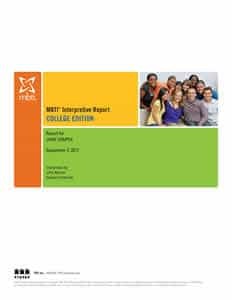 See a sample of a Myers Briggs Interpretive Report Sample College Addition. You communicate with others every day. You may not always take the time, though, to think about how your natural communication style affects others. Your Myers-Briggs®Communication Style Report is designed to help you become aware of some important differences in communication styles. 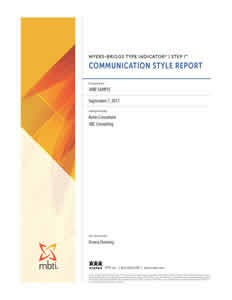 See a sample of a Myers Briggs Communication Style Sample Report. Your MBTI® Personal Impact Report is designed to help you make use of your MBTI results so that you can better understand yourself and others and improve the interactions in your daily life and work. See a sample of a Myers Briggs Personal Impact Sample Report. This report applies your results from the Myers-Briggs Type Indicator® (MBTI®) assessment to help you identify job families and occupations that are a good fit for your reported MBTI type. See a sample of a Myers Briggs Type Indicator Career Sample Report. This report applies information from the Myers-Briggs Type Indicator® (MBTI®) instrument to your team. See a sample of a Myers Briggs Type Indicator Team Sample Report. This team facilitator report is designed to help you lead a team-building session using the MBTI® Team report. It includes information about the team as a whole and tips to help you guide discussion among team members. See a sample of a Myers Briggs Type Indicator Team Facilitator Sample Report.